08-05-2014 - Will Ben Affleck Play More Online Casino Games? When you think about how many poker players there are playing online poker games across Europe, the number one ranked site is obviously doing a lot right. The Titan Poker site claims to be the number online poker room serving European players and it is part of the iPoker network. With the Titan Poker games and software being developed and maintained by Playtech, it is easy to see that this is a major poker option for players that is being backed with names that you can trust. Tens of thousands of poker players can be found online at Titan Poker during the peak periods and there are millions of dollars played for every month. When you add in the fact that there are countless satellite events sending poker players to some of the greatest and highest-ranking poker events around the world, Titan Poker is able to offer so much to poker players. In fact, you could argue that the only thing that Titan Poker lacks is a Mac download option! Sadly, there is no direct Mac software to play on Titan Poker but this doesn’t mean that Mac users have to miss out. 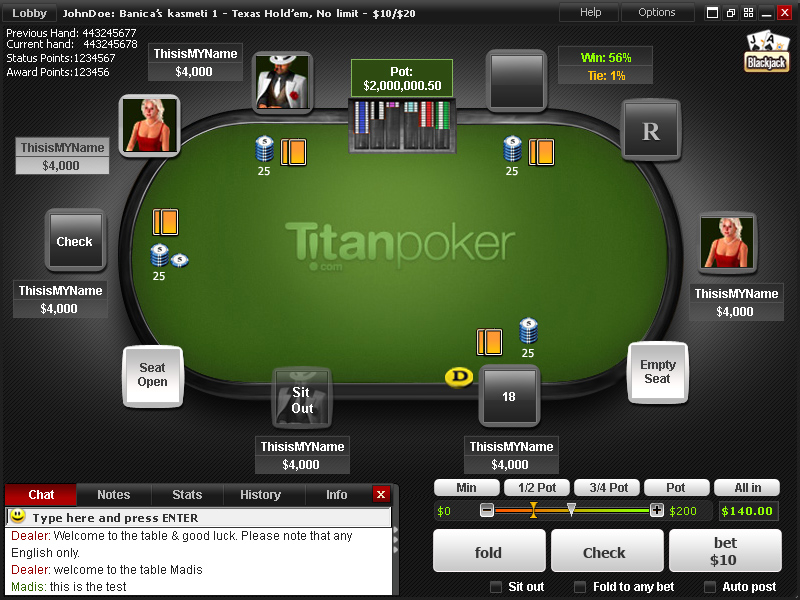 There is the ability to play Titan Poker in your browser and there is also the option to use an emulator to gain access to the Titan Poker site. This may not be the ideal way to play poker games on your Mac but considering that the Titan Poker site is a great choice for poker players, it is likely to be an option that many people will utilise. The fact that Titan Poker is not open to US poker players makes the deposit methods a lot more simple to work out. The limited nature of US friendly deposits will sometimes limit a site in what they like to provide to players but this is certainly not the case when it comes to Titan Poker. Players will find that they are able to use credit card payments, bank payments, FirePay, NETeller, Paysafecard, Click2Pay, Skrill, Entropay, EcoCard, WebMoney, bank drafts and so many more options. This should ensure that there is a deposit method that is suitable for everyone, helping to ensure that Titan Poker is one of the most used poker sites in the world. As the level of competition between poker sites is so high, it makes sense that there will be a great level of bonuses being provided by sites to their potential players. Titan Poker certainly believes in delivering a great level of bonuses to new players and there is a healthy welcome pack on offer to players when they sign up. Players can grab a 200% matched deposit bonus up to a value of $2,000 on their first deposit. Players have 60 days to earn their bonus which is paid out in $5 increments. When using the Titan Poker bonus code from www.bonuscodetitanpoker.org, you will get an additional $20 to $50 free, on top of the first deposit bonus just described. Players will also receive $1 in cash every time they receive 100 Titan Points and a new player will receive 4 free tokens to the $2,500 Freeroll tournaments, allowing them the chance to play for $10,000. There will also be automatic entry into the weekly $1,250 depositors freeroll and the monthly $10,000 bonanza! 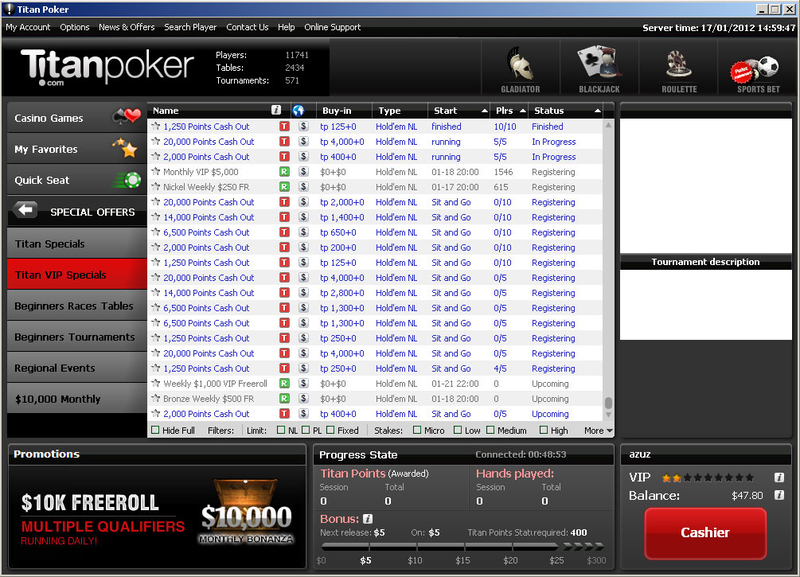 Not only but there will also be entry provided to the $25 booster freeroll events which take place every 3 hours. With beginners races, dedicated support for new players and plenty of tools and guides, Titan Poker genuinely looks after new players very well. The site also hands out a number of daily bonuses so there is a chance you could receive a bonus just by playing and being lucky or unlucky. There is a Top Hand Of The Day bonus where a hand of a K,K,K,K or higher is eligible for a bonus. The level of payout will depend on the type of game that is being played and the cash on the table. It is possible to earn a bonus up to $200. If you lose a real money Texas Hold Em game with this sort of hand, you will find yourself in line to pick up a Bad Beat Bonus. Players can earn themselves a bonus up to $250 if they suffer a loss in such a cruel fashion. If you are a sociable poker player, you will be delighted to learn that if you invite a friend to play on Titan Poker, you will receive bonuses. The more they deposit and play, the higher your cash and loyalty points bonus will be so there is definitely a great incentive to get all of your friends signed up for the site. With so many players on the site at peak times, it is obvious that there will be plenty of folk looking to enjoy tournaments. Thankfully there is a very full schedule of poker tournaments and whether you are looking for a daily, weekly or even monthly treat, there is a lot on offer that will keep you coming back for more on a very regular basis. With $5,000,000 guaranteed every month in tournament play, there is more than enough reasons to come back to Titan Poker! The $200,000 Sunday Special is the jewel in the crown of the Titan Poker site and this carries a $215 buy-in. Of course, there are numerous satellite events taking place throughout the week which means you can play your way to a seat at the biggest game of the week on the site if you would rather not pay that sort of money. The rewards on offer are definitely worth looking out for and this is the main attraction for the vast majority of Titan Poker players. There is also a massive game taking place every day on site under the Weekly Majors banner so if you are busy Sunday or you want to have additional poker fun, you will find plenty of options. Monday night sees the $40,000 GP High Roller event take place and this carries a suitably high buy-in of $530. Poker becomes more affordable after this with the big Tuesday night event being the $40,000 GP Super Tuesday, which has a buy-in of $109 and the Wednesday event, with a $33 buy-in, being the $25,000 GTD game. Thursday night is the €12,500 guaranteed game, with a buy-in of €109 and Friday is the massive $50,000 Guaranteed R/A game with the $109 buy-in. Saturday sees the $30,000 GP Freezeout game, with the $109 buy-in take place and if the Super Sunday offering is not enough for you, there is a $10,000 guaranteed game with a $7 buy-in and a $20,000 guaranteed game with a $10 buy-in. With daily Majors and plenty of other minor poker tournaments taking place all around the clock, you are not going to be short of poker tournament action! There is undoubtedly strength in numbers when it comes to Titan Poker and there are plenty of great bonuses, promotions, tournaments and excitement to be found on site. As there are plenty of great Mac friendly poker sites to choose from, a poker site really needs to offer something special to justify a non Mac friendly site to Mac players but Titan Poker is a site that is above the standard level of poker sites. If you are comfortable with browser play or you are happy to play via an emulator enjoy a great poker experience, the Titan Poker site is a very good option.